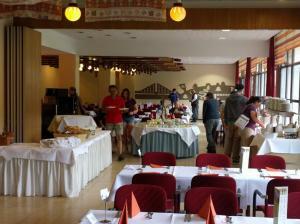 Unfortunately there have been some difficulties regarding Food & Drink at the hotel. Some people were confused and did not know when they can order food, and at which restaurants. If you own this card, you can show it anywhere in the hotel and pay a reduced price. 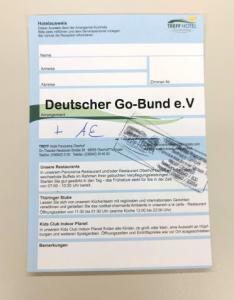 These cards were given to guests who booked their hotel room through the German Go Association (“DGoB”). If you booked through any other means, unfortunately the hotel can only offer you the full price. 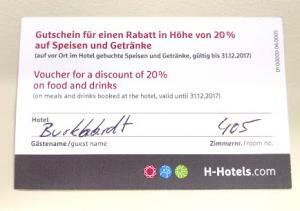 There are two types of Hotel IDs (“Hotelausweis”) the Hotel gave you when you arrived. You need to have your ID with you at all times and show it to hotel personel if needed. It’s not enough if you only show your room key! 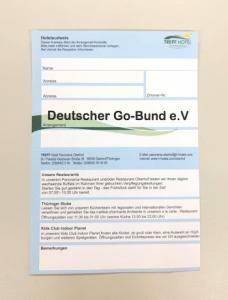 If your Hotel ID only has the text “Deutscher Go-Bund e.V.” (“DGoB”), this means you booked breakfast only. If it has a handwritten addition with a hotel stamp on it (“+AE”), you booked breakfast and supper as well. If you don’t have a Hotel ID, this means you have not booked any meal options. If you are missing the right Hotel ID for you, please ask for a replacement at the reception! They will happily print you a new one. 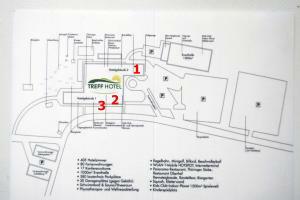 This map is printed on the back of your Hotel ID. Panorama Restaurant (1) and Thüringer Stube (2) are the two major restaurants. There is also the Rondell Bar (3), which you can find either by going up the stairs next to Thüringer Stube and then turning right or by following the Sidekicks Hall corridor. If you have a Hotel ID (“DGoB”) or (“+AE”), you may eat breakfast at 7:00 a.m. – 10:30 a.m. every day at Panorama Restaurant (1). There is an assorted buffet for you to choose from. Supper is at 6 p.m. – 9 p.m., with a full buffet. However, you can only eat supper here if you have a Hotel ID (“+AE”). If you don’t have the necessary ID for Panorama Restaurant, you may have lunch or supper at Thüringer Stube (2) instead. Opening hours are 5:00 p.m. – 10:00 p.m. Here you can order your food from a menu. Prices might be a little more expensive, but the quality of the food is above average as well. 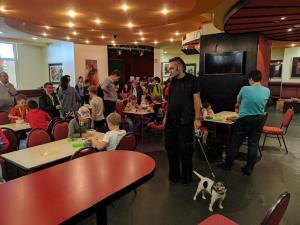 The area around Info Desk near the Top 3 rooms (“Super Heroes”, “Heroes”, “Little Heroes”) is often very crowded and noisy, without many places to sit. Your alternative option for hanging out, talking more loudly, playing games casually while drinking and having fun is the Rondell Bar. As a rule, the room should be open to congress participants at all times (there may be exceptions). 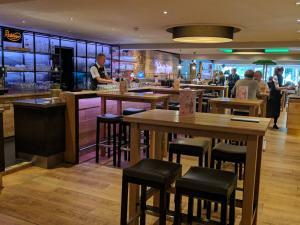 The bar itself will start serving drinks at 10.00 p.m. at the latest. Have fun and be considerate of others! When going to eat in other restaurants and bars outside of the hotel area, please make sure to leave soon enough. Most restaurants in Oberhof will offer warm meals only until 9:00 p.m. To avoid having to walk around to find other restaurants on short notice, try to find your seat in a restaurant at least 30 minutes before the kitchen closes. 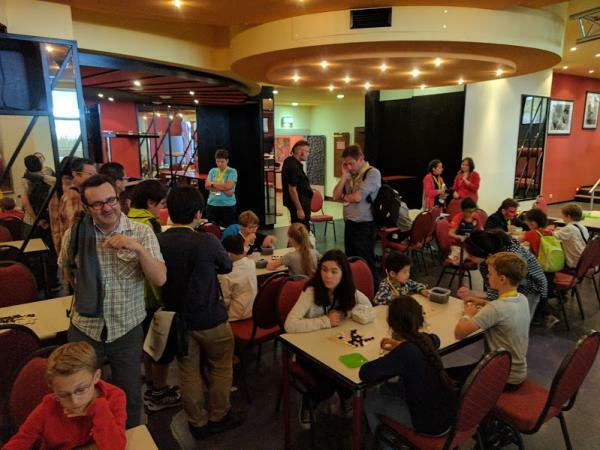 If you want to play Go at the same time, please borrow a Go set from the Info Desk.